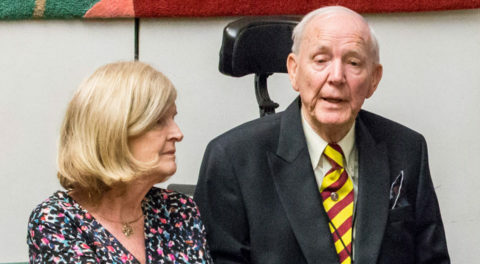 A terminally ill man who is due to die this morning (Thursday 7 February 2019) at the Dignitas facility in Switzerland has urged MPs to change the law on assisted dying. On the day of his death, Geoffrey Whaley, 80, who was diagnosed with terminal motor neurone disease in 2016, has released an open letter telling of the torment he and his family experienced after police were anonymously notified of his plans. In Geoffrey’s final weeks of life, he and his wife Ann, 76, both from Buckinghamshire, were subjected to a police investigation after an anonymous call was made to social services alerting them of the couple’s intention to travel to Dignitas so that Geoffrey could have control over his imminent death. Geoffrey and Ann have chosen to speak out about their experience in the hope that they can contribute to a future change in the law which would allow terminally ill people the option of an assisted death in the UK. “By the time you read this, I will be dead. With [my family’s] love and support I have been able to fulfil my final wish: to be in control of my end, rather than endure the immense suffering motor neurone disease had in store for me. “Geoff and I have been very happily married for 52 years. I have never seen him cry. The day the police called, he sobbed. Geoff’s carefully thought-through decision to have control over his end had enabled us to cope with his horrific illness and maximise the time we had left without worrying that he would suffer at the end. To think that my husband might suddenly be deprived of his final wish, and that I might be arrested for doing what any loving wife would do, was unconscionable. At present the police have stated that they will be taking no further action against the Whaley’s, but any further information which may come to light in future will be reassessed and the investigation could be re-opened. “Geoffrey and Ann’s story is a heart-breaking reminder of the cruelty that the current law inflicts on dying people and their families. Every eight days someone from the UK travels to Switzerland for an assisted death. Banning the practice in this country does not make it go away; it simply outsources death overseas, at huge financial, practical and emotional cost to the families involved. Please note that no interviews will be available with the Whaley family at this time. For further information, photos of the Whaley family or interviews with representatives of Dignity in Dying, please contact Ellie Ball at ellie.ball@dignityindying.org.uk / 0207 479 7732 / 07725 433 025 or Tom Davies at thomas.davies@dignityindying.org.uk / 0207 479 7734. Geoffrey Whaley, 80, and wife Ann, 76, from Chalfont St Peter in Buckinghamshire, have two adult children (daughter Alix and son Dominic) and four grandchildren. Before retirement, Geoffrey worked as an accountant and Ann worked for Formula 1 and the BBC. Geoffrey was diagnosed with motor neurone disease, an incurable, terminal illness, in December 2016. In December 2018 Geoffrey was given a prognosis of six to nine months. Assisted dying is prohibited in England and Wales under the Suicide Act (1961), and in Northern Ireland under the Criminal Justice Act (1966) which states that anyone who “encourages or assists a suicide” is liable to up to 14 years in prison. There is no specific crime of assisting a suicide in Scotland, but it is possible that helping a person to die could lead to prosecution for culpable homicide. In February 2010, following the Debbie Purdy case, the Director of Public Prosecutions (DPP) issued the prosecuting policy on cases of ‘Encouraging or Assisting Suicide’. It covers actions that happen in England and Wales, even if the death happens abroad. The policy includes a list of public interest factors that will influence whether or not someone is prosecuted for assisting suicide. The policy states that in cases of encouraging or assisting suicide, prosecutors must apply the public interest factors in making their decision about whether or not to prosecute. A prosecution will usually take place unless the prosecutor is sure that there are sufficient public interest factors against it. A prosecution is less likely if the person made a voluntary, informed decision to end their life, and if the assister was wholly motivated by compassion. A prosecution is more likely if the person ending their own life was under 18, lacked capacity to make an informed decision about ending their life or was physically able to end their life without assistance. The assister is more likely to be prosecuted if they had a history of violence or abuse against the person they assisted, were unknown to the person, were paid by the person ending their own life, or were acting as a healthcare professional. Currently, every 8 days someone travels to Switzerland from Britain for a legal assisted death – a process which costs £10,000 on average and often causes people to die earlier than they would have wanted in order to be well enough to make the journey. Polling has found that over half (53%) of Brits would consider travelling abroad for an assisted death if terminally ill and two-thirds (66%) would consider breaking the law to help a loved one do so, yet only a quarter (25%) would be able to afford it (Polling conducted by YouGov, August 2017). A further 300 terminally ill people end their own life in the UK every year. Assisted dying as an option for terminally ill, mentally competent adults in their final months of life is legal in eight US jurisdictions: Oregon (1997), Washington, Vermont, Montana, the District of Columbia, California, Colorado and Hawaii (January 2019). Victoria became the first Australian state to pass a Bill legalising assisted dying for terminally ill people in November 2017. The law will come into effect in June2019. A similar Bill was defeated in New South Wales by just one vote in November 2017. The Government of Western Australia plan to introduce an Assisted Dying Bill in their state Parliament in the second half of 2019. Canada legalised medical aid in dying (MAID) in June 2016. Dignity in Dying campaigns for greater choice, control and access to services at the end of life. It campaigns within the law to change the law, to allow assisted dying as an option for terminally ill, mentally competent adults with six months or less to live – something supported by 82% of the public (Polling conducted by Populus, March 2015).